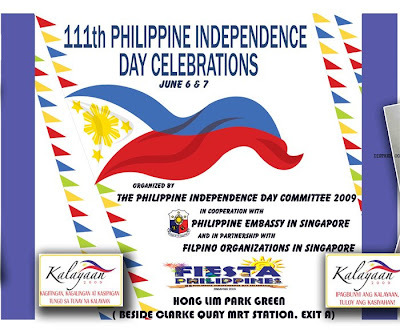 The Philippines Independence Day is being celebrated in Singapore this weekend and it looks like it will be a fiesta to remember. Wiki tells me that the Philippine Declaration of Independence occurred on June 12, 1898, when Filipino revolutionary forces under General Emilio Aguinaldo (later to become the Philippines' first Republican President) proclaimed the sovereignty and independence of the Philippine Islands from the colonial rule of Spain after the latter was defeated at the Battle of Manila Bay during the Spanish-American War. The declaration, however, was not recognized by the United States or Spain, as the Spanish government ceded the Philippines to the United States in the 1898 Treaty of Paris, in consideration for an indemnity for Spanish expenses and assets lost. It wasn't until 1946, that The United States recognized Philippine independence, and June 12, which had previously been observed as Flag Day, was designated the country's Independence Day. This year's Singapore celebration kicks off on 6th July at 6pm with the cutting of the ribbon and opening of events by Philippine Ambassador Minda Cruz. The Filipino Dance Club will get things moving before many Philippine popular artists with perform including Pamela Wildheart and Mau Marcelo (first Filipine idol). Then on Sunday 7th June, from early in the morning there will be something for everyone, from fun Pinoy games, stalls, an inflatable dinosaur for the children, lucky draws, a Ceremonial Fiesta Parade and a cultural show with many dancers, singers, and demonstrations to enjoy. It will be a real showcase of Pinoy talent, with artists from Manila performing as well as Singapore based artists. I have to mention here that in the evening, after 8pm, the members of the Rose Borromeo Spanish Dance Company will also be performing, and myself and five other girls will perform the Rumba Dance that we did at the Feria last month. This is a little nerve racking for me as there are far fewer of us dancing this time, so no safety in numbers! I hope I can learn from this previous experience (looking at the video of the performance I was definitely too stiff and nervous with not enough expression and interest) and hopefully this time I can really enjoy the three minute dance and do my best for the audience. I should clarify here that the Rumba has nothing to do with the Philippines, but Rose Borromeo is an icon there. She has over 40 years experience under her belt and was the dance partner of Maestro Ruben Nieto from the age of 17. She performed in numerous television and stage concerts in the Philippine's before making Singapore her home 27 years ago. There are quite a few Filipinas in her company, all of whom are beautiful dancers (I am not a member of the company and am simply a student so in no way fall under the 'beautiful dancer' category!!). The Filipino community is large here in Singapore, mainly consisting of domestic workers, althought there are a number working in information technology and the arts. Sunday is the domestic helpers' day off so there will be a good, relaxed crowd down at the river. Come and enjoy the celebration and experience a bit of the Pinoy culture.